Since my novel The Gate House is due out in May, I am thinking about the trip to England that inspired the novel. My husband and I stayed in a bed in breakfast in the market town of Spalding in Lincolnshire. We traveled to that part of England because his ancestors had come from their in the 1800s. The bed and breakfast where we stayed was, in fact, an old railroad gate house. In the early days of railroads, a gatekeeper would live in a cottage next to the crossing, and go out to raise and lower the gate as required when people needed to cross the track. The building where we stayed had been added to and renovated over the years until it became the family home with two or three extra bedrooms upstairs for guests. Our host prepared a delicious full Scottish breakfast for us, and even took us out in his car to a nearby town to visit the church where my husband’s great-great-grandparents were married. While he was learning about his family history, I was imagining the story that became The Gate House. After all, an old house like that must have a hidden staircase, a secret room or maybe even a ghost. Check out the “real” Gate House, and maybe book a room on your next trip to England. 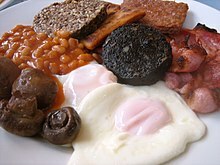 A full Scottish breakfast. That black lump is black pudding, a type of sausage made from pork blood and oatmeal.